Incoming Vice President Leni Robredo revealed on Facebook that her family is very much into basketball, just like a lot of Filipinos. 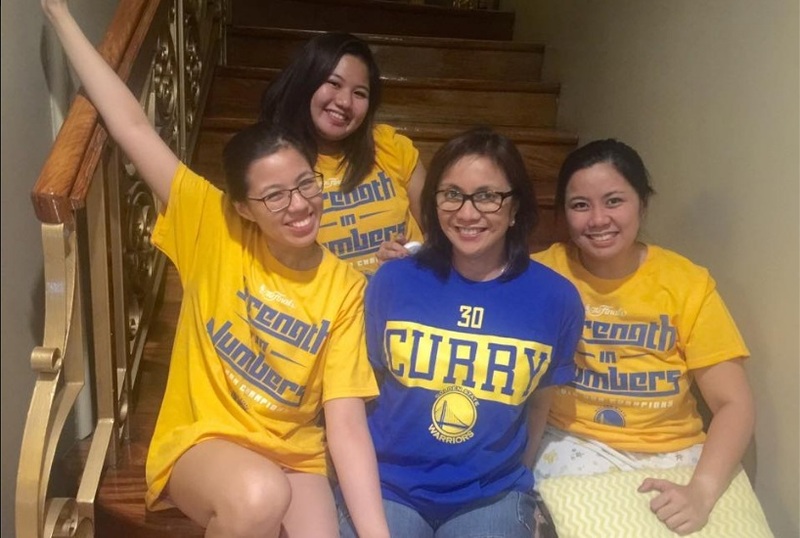 Leni shared a photo wherein her daughters Jessica Marie, Janine Patricia, and Jillian Therese donned shirts of the Golden State Warriors (GSW). The VP-elect herself was all smiles as she wore a blue shirt bearing the name of Stephen Curry, GSW's star player. You know you live in a basketball-crazy household when your kids make you wear a Golden State Shirt at 12 midnight in anticipation of Game 1 Finals later today. Buhay na buhay ang espirito ni Jesse sa aming mga anak — with Tricia Robredo, Jillian Robredo and Aika Robredo. According to Leni, her late husband Sec. Jesse Robredo was a Super Lakers fan, while Aika is a Celtics fan. Leni is obviously a GSW fan, look at how she wore that Curry shirt ! A lot of her supporters were delighted that the incoming VP is taking time off with her family. Leni had a jampacked schedule during the campaign period of the May 2016 elections, with countless sorties nationwide, as well as guestings in a lot of shows and functions. All her daughters also actively participated in the campaign, going to different parts of the country to promote the vice presidential bid of their mother. Leni won by a very slim margin over Sen. Bongbong Marcos in a hotly contested race for the vice presidency. She was officially proclaimed as the Philippines' new Vice President, along with Rodrigo Duterte who won as President.